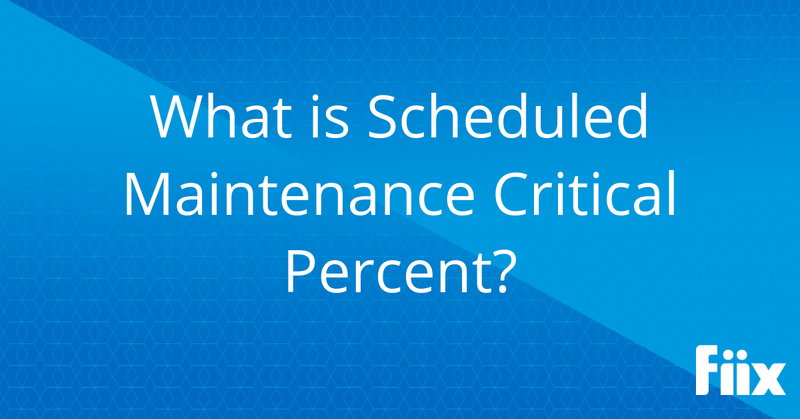 What is Scheduled Maintenance Critical Percent? We know that sporadic ongoing repair (the ‘fix it when it breaks’ mentality) leads to shorter asset life, and increased long-term capital costs. Planned maintenance (or preventive maintenance—in both cases shortened to PM) helps combat this and prevent breakdowns by scheduling maintenance at regular, predetermined intervals. The primary goal of scheduled maintenance is to prevent equipment failure before it actually occurs. This includes inspections, adjustments, regular service and planned shutdowns. Standard scheduled maintenance can help increase the lifetime of your assets and reduce the need for part repair or replacement. But what happens when you’re faced with several overdue planned maintenance tickets? Say you have two tickets on identical systems—the first is a monthly PM that is three days late, the second is a quarterly PM that is five days late. At first glance, you might assume that the five day late PM should be completed first. Instead of assuming, you can actually calculate the critical percent for the preventive maintenance action and determine which PM is the priority. What is scheduled maintenance critical percent (SMCP)? At first, it might seem like the five day late quarterly PM should take precedence but after we perform the critical percent calculation, the monthly PM takes priority. Unplanned maintenance is generally more expensive than planned maintenance, so performing PMs on time or as close to on time as possible can help avoid any unscheduled breakdown, repairs, and downtime. This calculation is a simple way to determine which overdue planned maintenance items should be completed first. Critical percent is easy enough to calculate, but a good CMMS should come complete with critical percent reports.